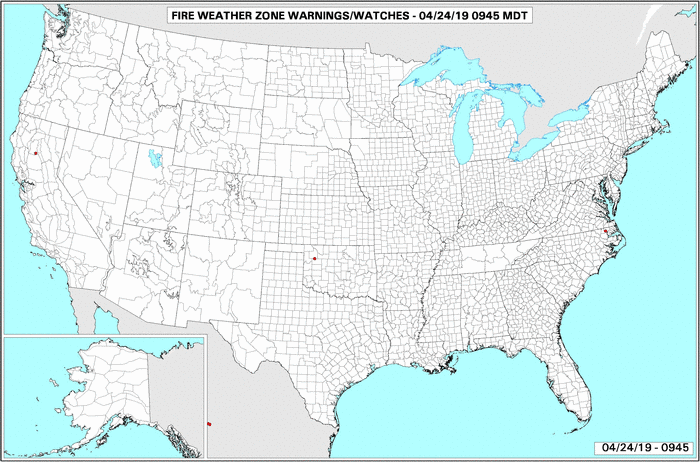 This page contains fire detection maps and summary information by various fire-related geographic themes for the 12-hour period ending at the specified time (all specified times are Mountain Time). Tabular summary information includes fire detection locations within the area defined by the continental United States, Alaska, Hawaii and Canada including a 50-kilometer buffer. The detected fire locations are based on satellite observation data acquired by MODIS, AVHRR and GOES. The USDA Forest Service attempts to use the most current and complete geospatial data available. The accuracy of this data depends on a number of factors, including database update intervals. We do not claim responsibility for the accuracy or completeness of this data. The USFS attempts to use the most current and complete geospatial data available. Using these maps or data for other than their intended purpose may yield inaccurate or misleading results. The USFS reserves the right to correct, update or modify geospatial inputs to these maps and geospatial analysis without notification. Although these data have been used by the USDA Forest Service, the USDA Forest Service shall not be held liable for improper or incorrect use of the maps and data described and/or contained herein. These maps and data are not legal documents and are not intended to be used as such. The information contained in these maps and data is dynamic and is updated daily throughout the current year. It is the responsibility of the user to use the maps and data appropriately and consistent within the limitations of geospatial data in general and these data in particular. The USDA Forest Service gives no warranty, expressed or implied, as to the accuracy, reliability, or completeness of these maps and data. It is strongly recommended that these maps and data are directly acquired from the USDA Forest Service server and not indirectly through other sources which may have changed the maps and data in some way. Although these maps and data have been processed successfully on a computer system at the USDA Forest Service, no warranty expressed or implied is made regarding the utility of the maps and data on another system or for general or scientific purposes, nor shall the act of distribution constitute any such warranty. This disclaimer applies both to individual use of the maps and data and their aggregate use with other data. Utilizing the maps and/or data from this page indicates your understanding and acceptance of the terms described above. For additional information on the USDA Forest Service Active Fire Mapping Program, please contact Brad Quayle at the USFS Remote Sensing Applications Center (801-975-3737 or bquayle@fs.fed.us).